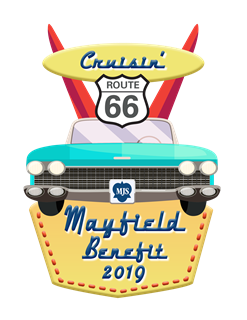 	Join us as Mayfield Cruises Route 66! Hop in your jalopy and head to the Langham Huntington on Saturday, May 11, 2019 for Benefit 2019: Cruisin' Route 66! The annual Benefit celebrates the Mayfield Junior School community and raises important funds for the Endowment. This year's Benefit proceeds will be directed to an endowed fund in honor of our retiring headmaster, Joe Gill: The Gill Fund for Professional Development. A Patron is someone who makes a donation to the Benefit in support of Mayfield. There are different levels of patronage and each comes with a different set of perks. By becoming a Patron, you not only help underwrite this fun event, but also support the Mayfield Endowment. Please read below for the various Patron and Underwriting opportunities available. Become a Patron or Underwriter today! Become a Patron or Underwriter! We are looking for help building auction packages! …And anything you are able to donate! Feature your Classic Car in our First-Ever Car Show! If you are a car collector we invite you to partcipate in Mayfield’s first-ever car show! The car show will take place during the Benefit cocktail hour. Hot rods, muscle cars, classics and exotics are all welcome! Entry form deadline is Friday, April 12, 2019. Participants will be selected and notified by Friday, April 26, 2019. Due to space considerations, it will not be possible to accept all entries.